I wonder how many people with modest amounts of land (even farmers) have been stirred in the past by seeing what great landowners were doing, saw whole villages moved, or read about Repton’s Red Books, and started to look at their places in a different way. Who first thought that land was worth looking at, apart from calculating crops and estimating values? The poet William Shenstone is often cited as a pioneer. He went to Oxford, inherited a farm called The Leasowes in the West Midlands, and bankrupted himself in treating it as a big garden. He died in 1769. William Gilpin from Boldre in the New Forest coined the expression ‘picturesque’, but there must have been quite a few minor gentry who looked out of their study windows with a fresh and critical eye. It might have just been planting a tree or cutting one down. It might have started with taking a new route for the daily tour of the farm. Something triggers a more critical eye, or one with a different agenda. Why not explore that copse? I didn’t notice before that I can see the Downs, or the church steeple, from the gate into the upper field. Soon the farmer is calculating that by coppicing the hazel below his path he can catch a glimpse of the distant hills. I know because it has happened to me. Wyken is a Tudor farmhouse that has grown this way and that over the centuries; a wing here, a wing there. Sir K. and Carla, his American wife, who entertains Country Life readers with her astute and witty column, are active gardeners. They have organized the space around the whimsical footprint of the house with simple, authoritative green-hedged arrangements, a sort of flowery stockade around the dwelling. Then paths lead out; to a rose garden, to a parterre, to an orchard; then a vegetable garden. Beyond are sheep meadows (with llamas for vertical emphasis) then hedges of a less formal cut, then the arable fields, woods and copses of a Suffolk farm. Each door and window has a considered view; a garden leading out to a prospect. Walking the fields with the owner it becomes a narrative. What was a ten-acre cornfield is now a wildflower meadow surrounding a lake, serving as a reservoir (this is the driest part of England). 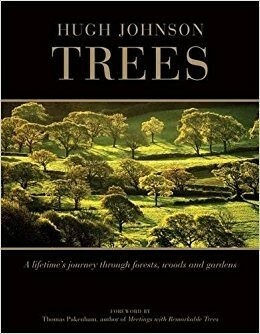 The scattered clumps of trees are a dendrologist’s collections of oaks and hornbeams. The path doubles back through hazel coppice and an ash plantation (with the depredations of Chalara all too evident) to the top of the Wyken vineyard, with distant views down a valley. You pass a barn for tractors, ploughs, harrows; the impressive implements of a modern farm, and return through an orchard to precise horticulture; box enclosures and a fountain. If this seems logical today; to apply aesthetic ideas to your surroundings, it apparently didn’t before the 18th century. Nor does it today, alas, on the evidence of a drive through most parts of the country, or almost any town. 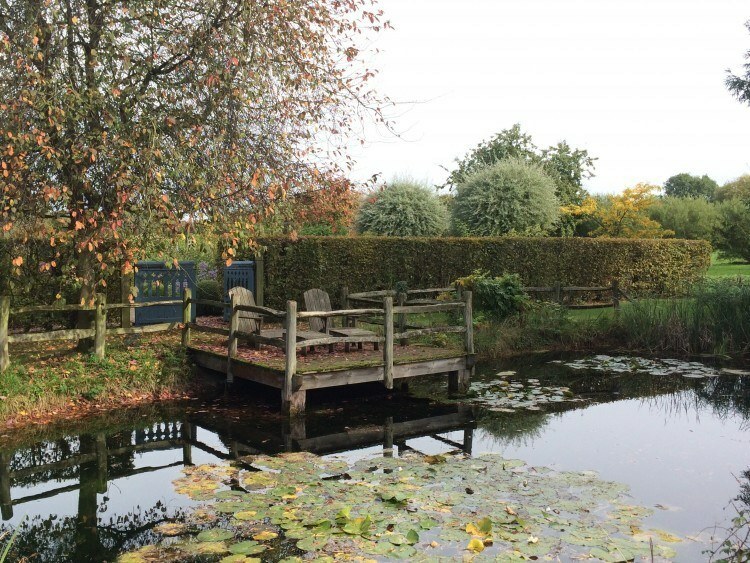 Wyken Hall garden is open to visitors on weekdays between March and October. So is the vineyard. Better still, its excellent wines can be bought at the Leaping Hare Cafe, one of Suffolk’s best restaurants, and its too-tempting shop, near the house. Bluebell Nursery and Arboretum had been on my must-visit list for far too long. Its name comes up so often when I look up anything woody and unusual. I wasn’t very clear where to find Ashby de la Zouch, alluring though it sounds; the answer is between Leicester and Burton on Trent, a part of the country I hardly know at all. Zouch, my screen tells me, derives from souche, a tree-stump. Could there once have been such a whopper there that they put in on the map? Or might it have had a less corporeal significance, as in The Noble Stem of Jesse? What stands out in a garden on a first visit is above all the plan; it should be clear, and it should make you want to explore. 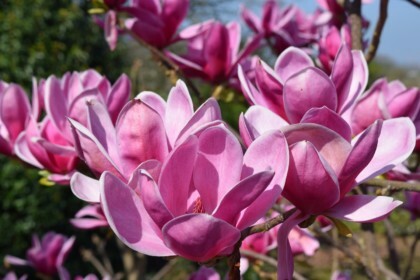 Then it is all a matter of timing – and late September is very much between seasons. 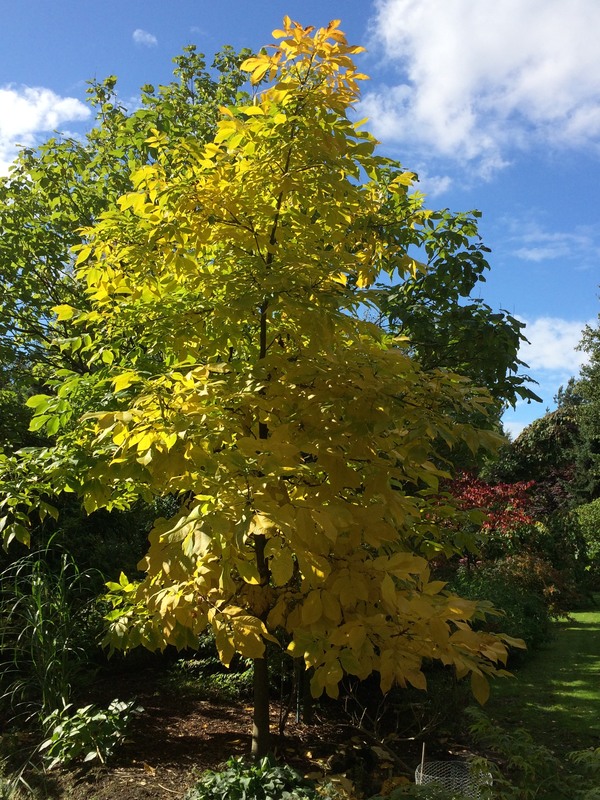 Early autumn colour was largely yellow, brightest in Cladrastris kentuckea (or lutea), the so-called Kentucky Coffee tree. Its little fragrant flowers alone hardly make it worth growing, but it can be a glowing golden beacon. Celastrus orbiculatus was almost equally bright, but I’m not sure the tall tree it was strangling would have been very keen. Red was provided mainly by berries. Every time I see the American Ilex verticillata I make another resolution to plant it. A deciduous holly doesn’t sound particularly tempting when we have so many evergreen kinds, but it carries masses of scarlet berries like few other shrubs. Two generations of Robert Vernons have created first the garden and nursery, then an expanding arboretum. I asked ‘young’ Robert why here. ‘Needs must’, he said. The site they were hoping to buy was sold for housing. Ideal this is not. Open soil and good drainage are , you would think, the first requirements. How encouraging it is to see how many things are thriving on stodgy clay with only shallow trenches for drainage. 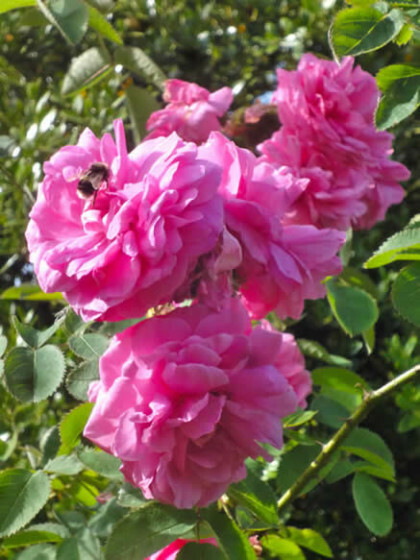 The secret, of course is in sensitive and specific cultivation; the excellent labelling includes notes on their different mulches and when they are applied. There was a pungent smell of spent hopes from a local brewery in the air. The garden is mature, personal and intimate, a meandering journey through a deeply interesting collection of trees, shrubs and generous clumps of perennials. The eyecatchers, of course, in September were hydrangeas; even the fading panicles of Hydrangea paniculata are graceful and full of light. Anyone would be tempted. ‘Do your customers know what they are looking for?’ I asked Jason, the manager. ‘A few’, he answered. ‘The trouble is they expect big plants, but we can’t grow fields of rareties. They can be a bit crestfallen when they wait a year and then are given what looks like a stick in a pot’. It was Lionel de Rothschild who said, talking to a City gardening club in the 1920s, ‘No garden, however small, should be without its two acres of rough woodland’. I was reminded of him when the Duke of Devonshire, taking a party of Garden Museum patrons round Chatsworth the other day, said ‘We realised there is something like fifteen acres of woodland between here (the arboretum) and the house doing nothing special, so we’ve asked Tom Stuart Smith to do us a design for it’. 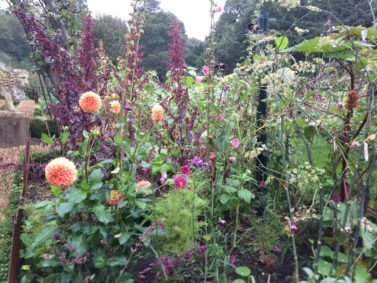 I’m not sure whether the 15 acres are included in the 110 acres of the present garden, or will bring it up to 125, but the signs are that Steve Porter, Paxton’s current successor as head gardener, and his team will take them in their stride. To say that the Cavendish family is restless is an understatement. Renewals and new projects are the lifeblood of Chatsworth. The scaffolding is slowly coming off the house after ten years of constant building work. The rockery that Joseph Paxton built of massive gritstone blocks is one of the horticultural wonders of the world. It is in the middle of being restored to its original monumental stony state. But then so is the cascade, and the Emperor fountain – though perhaps not quite to the 276 foot plume it once reached. 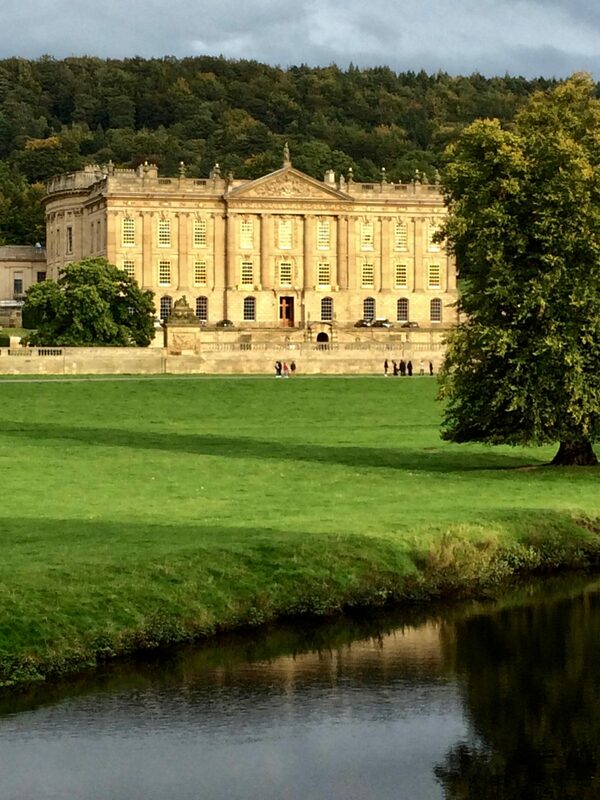 The sense of creative energy, and sheer all-encompassing competence, at Chatsworth is palpable. All the more winning, then, I thought, is the gentle, almost whimsical vegetable garden. There is no bare earth to be seen, few rigid ranks; just a tapestry of leaves and flowers that wouldn’t frighten Helen Allingham. Now the cyclamen are declaring their unremembered or unexpected presence almost anywhere that seems unpropitious, but especially in the bottom of box hedges, and also in a pot of Pelargonium ardens, (whose flowers, if it hadn’t stopped flowering, would have made the most alarming Christo-type clash of knicker and flame) the mood of the garden has changed. Geraniums that dominated the summer have pretty much packed it in. Honorine Jobert, of course, is till the lamp in the leafy corner. The little white stars of Aster divaricatus in their modest floppy way are a reminder that Gertrude Jekyll had an eye for a good plant. The most modest of fuchsias, ‘Hawkshead’ has woken up and droops its miniature white bells among the muddle of plants planning their retirement. Flop is the feeling in a border where Sedum spectabilis ‘Brilliant’ looks fagged out. Wonderfully enduring and upright and still flowering Acidanthera murieliae (I forgot to water their pot until mid-summer) are the sweetest-smelling thing in the garden, as well as the most elegant. And there are leaves that are paying their rent despite a dearth of flowers: Salvia vitifolia, pale, soft and striking, and Fuchsia boliviana against the east wall. Why didn’t you dangle your scarlet tubes this year? Not one. Now our total tomato crop is in: eleven tiny ones and another ten teeny, the greenhouse star is the bizarre Brillantaisia owariensis. I begged a cutting when I saw a pot of something rather like a long-stalked hosta in a French friend’s dark stairway. I had no idea it would respond to light and lots of water with long spikes of salvi-ish purple flowers. It is apparently an acanthus cousin from Madagascar and those parts. In Kensington Gardens meanwhile only one tree has committed itself to autumn; the tall gleditsia outside the Cambridges’ quarters is shining yellow. Sweet chestnuts all over the gardens have such a crop of nuts they look like green chrysanthemums. A cluster of hawthorns, Crataegus prunifolia, are firing up in deep shades of red and orange and gleaming round scarlet haws. No cold night has come along yet to change the whole leaf palette. Back from a fin de saison visit to our daughter and son in law’s house at Beaulieu sur Mer, high above Beaulieu Bay with a gull’s view of the megayachts at play and the villas and gardens of Cap Ferrat across the water. Sadly the money these days is almost all on what we used to call Gin Palaces. Proper sailing yachts are the rare exceptions; I leap to the binoculars when I see sails approaching. We’ve been working on the garden here for over ten years now, and parts are already more than mature. I’m afraid we don’t stint on watering as we probably should, but on this precipitous hillside exposed all day to the sun (its local name is La Petite Affrique) no water means no garden. The big excitement of this visit was a storm. There had been no appreciable rain since April. Not much wind for sailors, come to that, either. Saturday dawned bright and clear. Then the atmosphere over the sea dimmed. You could see a grey front to the southwest and smell approaching rain, At teatime thunder and rain came together, vertical clattering rain, the gutters spouted, rivers formed in the gravel; we were marooned in the house all night. Regular irrigation in a warm climate gives you tremendous growth and keeps your shears constantly at work. Even drought-loving rosemary excels itself; we have thick hedges of it, and eight-foot stone walls completely draped. Lawns of Kikuyu grass, with its racing stolons, have to be watched carefully; they can grow thatch like a cottage and zoom out sideways to climb a drystone wall. Olive trees far prefer bare ground. As for box, as vital here as in London, the caterpillar fight is fierce. Regular spraying with Xen-tra is working, fingers crossed, so far. The components of the garden are far from original: cypresses, olive and citrus trees, vines on a pergola, wisteria, rosemary, box, lavender, agapanthus, echiums, Anemone japonica, Hydrangea quercifolia, roses (Iceberg loves the heat), Tulbaghia (alias Society Garlic) spreads like mad, and so does perowskia – to our delight when earlier flowers fade. So all green and white and purply colours – no reds (except unstoppable campsis on the house). A general lack of eye-catching highlights, in fact. In the end the whole point is the view, down to the sparkling bay, up to the towering cliffs, and out to the horizon. Now and then I can’t resist quoting my correspondent in Japan. We have a mutual interest in special trees, and the weeping Katsura (Cercidiphyllum japonicum ‘Pendulum’) comes high on the list. ‘I have something very big and beautiful to show you,’ she writes. ‘I went to see the great weeping Katsura of Ryugenji’s Temple, in Iwate prefecture …a rusted sign erected in 1992 says it is 22 metres high … There was a breeze but unlike the slouched whip-like sweeps of a weeping willow it stood straight and just swayed slightly, like the ladies of Downton Abbey (although these trees are always male). The original tree, a Katsura mutant, is thought to have been found in the mountains and planted around 1574 when the temple was built. But she ends on a note much nearer to home: the dreaded cydalima. ‘How to get rid of box caterpillars? Everyone seems to be crying for help here too’. 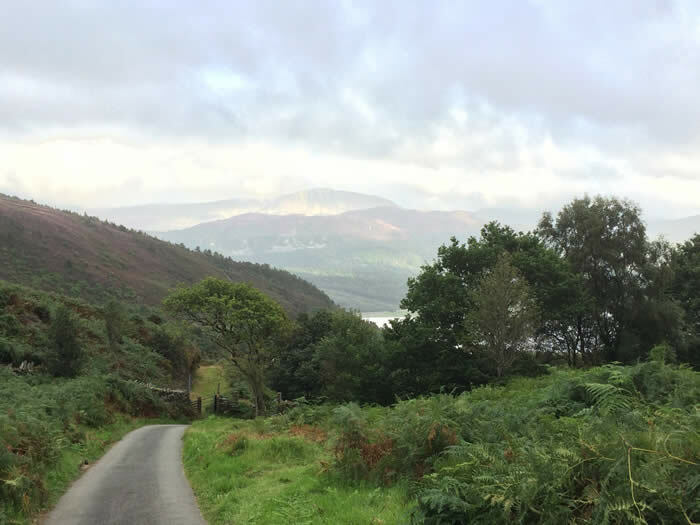 We don’t expect to spend much time on the broad sandy beaches of Snowdonia in August. Nor did we. But days of solid rain had done magic for the streams that chatter and gurgle through our woods. There are springs where I’ve never seen them before; the expensively-surfaced tracks are water-courses, their stones washed loose, and some of our stream-side paths have become stream-beds. But the new roof on our old mine building (we’ve upgraded its name from ‘the hovel’ to ‘Myrtle Mansions’) keeps us dry, and its new skylight lets in daylight we never had before. There is a whole complex of ruined mine buildings where our goldmine used to be – or rather would have been if they had ever found gold. This was in the 1840’s and 50’s when gold fever seems to have broken out round the world: California, Australia, Canada, Colorado, New Zealand, and even Wales. (South Africa and the Klondike came later, in the 1880s). For a short while the Mawdach Estuary was a baby Ballarat. Our mine includes the remains of the grinding shed, where the power to grind the ore was provided by a 30 foot overshot waterwheel, a couple of other buildings now reduced to their grey stone gables, and what we take to be the canteen and the manager’s office. The canteen has a huge hearth and the manager’s office a little one to keep his back warm as he watches his workers (some of them seven years old) through a panoramic (by Welsh standards) window. But the best part is the mine itself, a horizontal ‘drive’ hacked and blasted a hundred yards into the hillside – at which point they realised that copper was the best they were going to get. The mouth of the mine is our grotto, a jagged hole in the hill, dark grey stone adorned with ferns, with a slow brown stream flowing out into the woods. When we bought the property I was worried that someone might be tempted to explore, wander in and fall in the darkness, so I installed a gate of vertical iron bars. Years later I had a letter from the Welsh Bat Authority in Cardiff, telling me a colony of bats hibernated in the dripping blackness. Was I aware, it asked, that lesser horseshoe bats prefer horizontal bars? I still wonder who asked them. To Kew to see the new Broad Walk Borders, all 640 yards of them, in their midsummer glory. Eighteen months after their inauguration they are splendidly established, and on a sunny weekend thronged with admirers. There was a long queue at the Victoria Gate waiting to get in, but then there is more than ever to see and do. 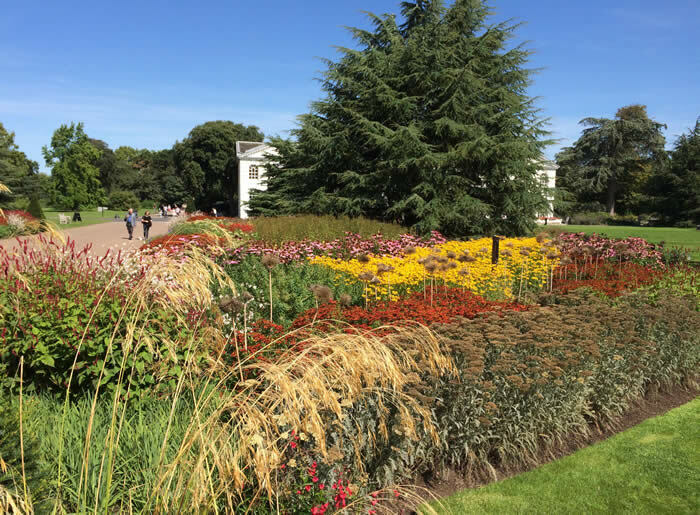 The balancing act between botanical garden and public attraction is not easy, but Kew is managing it well. There are a few visitors who complain that the museum building facing the Palm House over the pond is now a restaurant, but I’m sure there are more who are pleased to have a grown-up restaurant as an alternative to the predictable cafes. The Broad Walk Borders are a wonderful tour de force, interspersing the cream of modern cultivars of the best herbaceous plants with things you won’t see outside Kew’s collections. I spent the best part of an hour admiring each side and its ingenious themes of plant families and reproductive systems. To solve the near-impossible puzzle of labelling in herbaceous borders there are plant keys at intervals, stylised coloured diagrams of each section that make it easy to identify the bold blocks and sweeps of different colours, sizes and habits. Meanwhile the Temperate House is beginning to emerge from the covers that have hidden its years of restoration as possibly the greatest plant palace on earth. Next summer we shall see its full glory, too.